I'm not sure if my obsession with goats has anything to do with my equally absurd obsession with their cheese (does it matter? ), I love both. I smear the crumbly, creamy, earthy cheese on just about everything, from crackers to bagels, to dark chocolate bars. So making this recipe again didn't take very much arm pulling. It was more like: "Valerie, will you make those goat ch..." Me: "ok."
These brownies are...what? They're just amazing. Their texture is a wee bit cakey, but that slight brownie indiscretion is completely forgivable thanks to the goat cheese. If you like cream cheese-swirl brownies, I honestly believe that you will adore this upgraded version! They're rich, yet humble- comforting, yet edgy. 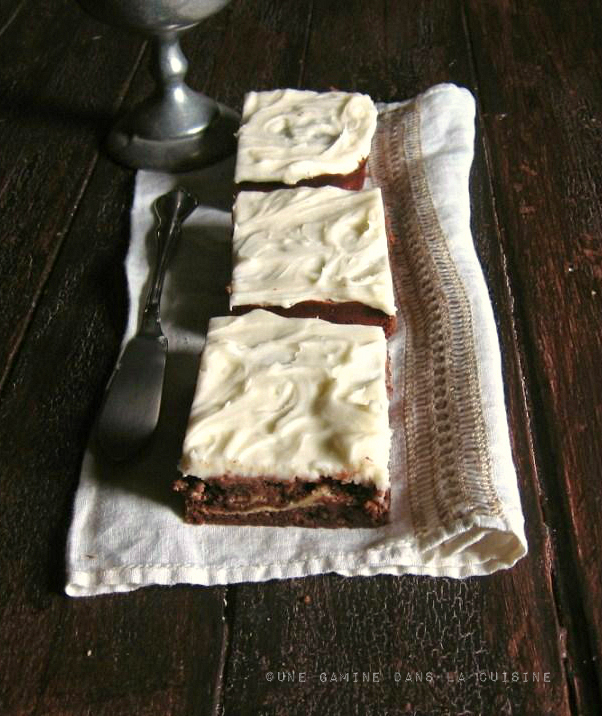 And who could not fall head over heels for a brownie that's smothered with goat cheese and honey frosting? Very unique and very delicious! It would be so fun to have a goat, I want chickens too! Yep I think I would be deliriously happy with my own goat as well. That being said, those brownies look like my kind of brownie. 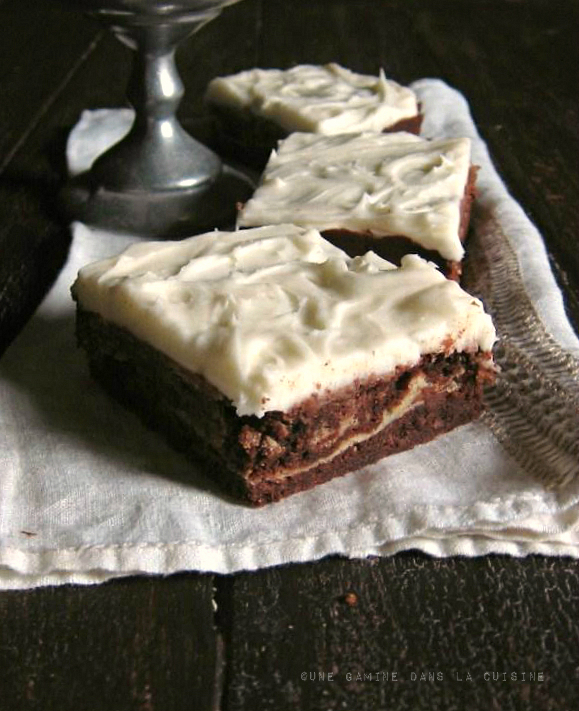 Goat cheese and brownies together sound like magic! well, Valerie, we could be twins. I have a long and ever changing list of recipe ideas, and scrawled on there is "goat cheese brownies" - a mashup of two of my favorite things. Valerie these look to-die for good! First the goat cheese itself has got to be just tangy perfection in them, balancing the chocolate. And the brownies look dense, fudgy, rich & perfect! I just ran into your blog through Pinterest and I must say that I am in LOVE. I am also completely ga-ga over goat cheese (more than with goats I must say), and really (really!) need to make these asap. Believe it or not, my cousin and her husband raise goats. It's actually a lot of work, but they love it. I think they'd love it even more if they saw this recipe. These brownies look fantastic. Even before I saw your gorgeous photos I knew that I would love - LOVE! - these brownies! I'm swooning over them - what a great flavor combo! You've convinced me, and although I don't usually frost my brownies, I imagine the goat cheese really cuts the sweetness of the brownies, great idea! OMG! you never cease to amaze me with your fantastic baked goods - these look fabulous and are so creative! Bobby Flay did a brownie throwdown against the VT Brownie Co (I think that's the name), and their signature brownie was swirled with goat cheese! So this is not a foreign concept to me, but I've never seen it anywhere else. YUM! your brownies look so rich and delicious and the frosting is drool worthy for sure. I would never have thought of using goat cheese for a topping because of its sharpness but I will take your enthusiastic word for it that it works. They certainly look good. 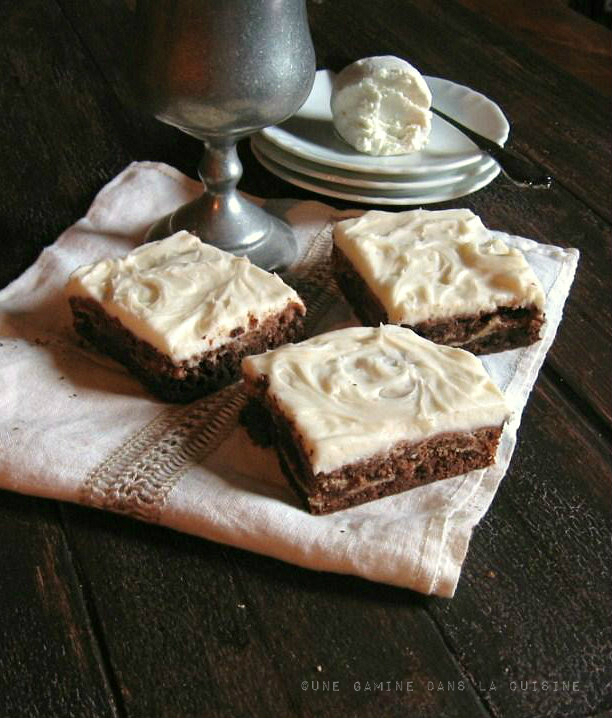 I LOVE goat cheese but somehow have never baked with it - I see these brownies in my near future! i adore goat cheese, it's a cheese i can actually consume! it's never once occurred to me to use it for icing/frosting. these are to die for! LOVE these brownies! Goat cheese here I come! Valerie, I've never actually made goat cheese brownies before! This is all new to me! I love goat's cheese, so I'm sure I will love this, too! I'm not a huge fan of goat cheese but I would totally try this recipe in my garden kitchen - your images are fabulous and I can't wait to stop back! Love that you incorporated goat cheese in this dessert! I am a bit obsessed with goat cheese and love it each time I have it, especially with a glass of sauvignon blanc. Lovely photos!! Lol! You are killing me! Me and my sister have a little goat obsession, I thought we were the only ones. These brownies look awesome! Who doesn't love goat cheese? Goat cheese with brownies - very creative! They look gorgeous! Um... WOW! You creative creature, you... this is freakin' fantabulous! I can't describe how much I love goat cheese, and goats! These brownies are so pretty! Like they are snow-covered - how appropriate for the season! As a lover of both goat cheese and chocolate all I can say is wooooowww!! What a unique and creative combination. Thanks so much for sharing. I feel pretty much the same about goat cheese...not sure I could handle the goats though :) However, I could handle a few of these delicious beauties! Geeze, Val, somehow I missed these beautiful gems! What a delicious recipe...just added to my must make list!!! We do have goats, and bees. We feel blesses every day to live in gods country. Now that the diary goats have kidded, it's time to think about new ways to use their milk! I'll post a link on our farm page on FB too.